My step-by step furniture tutorials are meant to inspire everyone from beginning DIY’ers to seasoned paint pros. I believe there is always something new to learn or a better way to do just about anything. I share antiquing techniques, stenciling, decoupage, prep instructions, metallic paint projects, distressing techniques, chalk finish details, and techniques I think up on my own. Some are a bit crazy but that’s how I role. You can’t learn a better way unless you take the plunge. Most of the comments and questions I receive are about specific paint techniques or questions on prepping furniture. I try to answer your questions but occasionally I just have to say I don’t know. 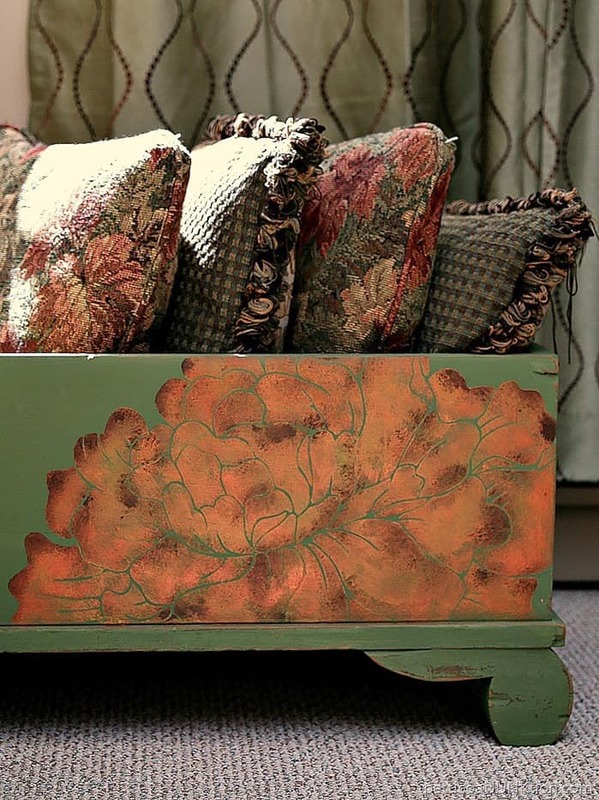 Painting Furniture With Metallic Paint. The metallic paint craze for furniture may be over or on the down trend. I think there is always a place for a bit of metallic paint even if it’s just a painted drawer or a pretty stripe. The first metallic paint I used was Martha Stewart Special Metals and I really loved it. Unfortunately they don’t make it anymore. I now recommend Modern Masters Metallic Paint Collection. The paint is water based and goes on smoothly. You Can Stencil If You Know The Secret. It’s true. The secret to stenciling is using a very dry, hardly wet with paint, stencil brush. Dip your brush in the paint then wipe almost all of it off on a paper towel. Then you stencil. This is my number one post/tutorial every year. I can’t understand why because the photos are horrendous. I painted the cedar chest in 2013 and the special Vaseline distressing technique still rules today. It’s not like Vaseline is expensive or difficult to find. The basic technique is to paint the furniture or picture frame or whatever you want then when the paint is dry wipe a bit of Vaseline over the areas you want to distress. Next apply your second paint color and once it is dry wipe take a damp or dry rag and rub the areas where the Vaseline was applied. The top layer of paint should come off without too much difficulty. Not only did I decoupage the nightstand with pretty fabric I filled the original drawer pull holes and and traded out the pulls for knobs. The nightstand was totally transformed. I prefer using fabric over paper as decoupage material because paper tears easily and the bubbles are harder to get out. At least that’s what I’ve found. 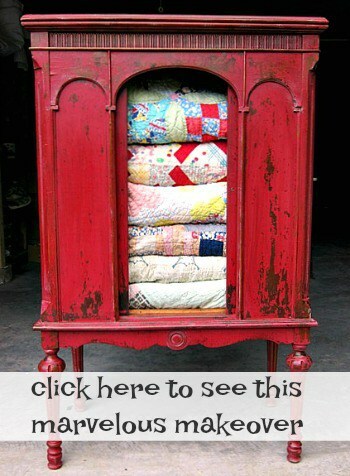 How To Age Or Antique Painted Furniture. How To Prep Furniture For Painting. Getting furniture ready to paint is the hardest and most time consuming part of any furniture makeover. Not only does the furniture need cleaning it may need repairing. How To Cover A Chair Seat. If I’ve said this once I’ve said it 100 times… “A chair makeover where you paint the wood frame and recover the chair seat is the easiest furniture project you can do that will make the biggest impact”……or words to that effect. 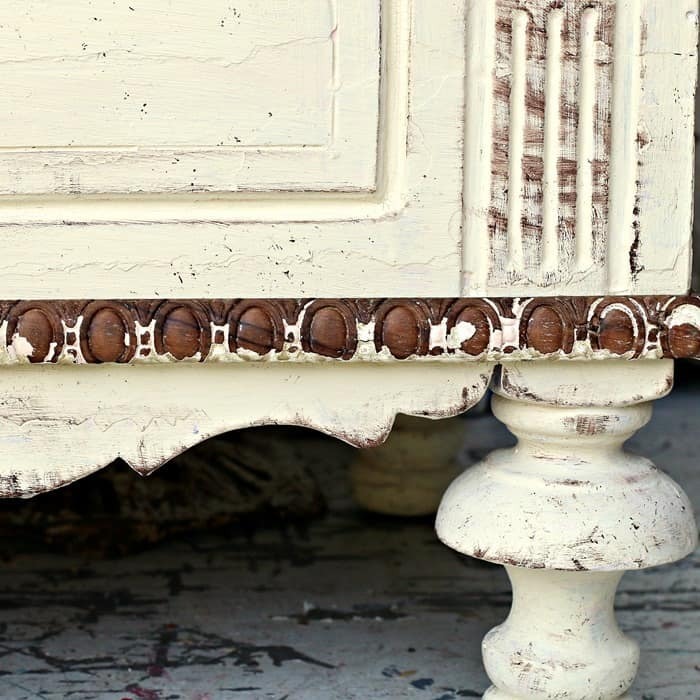 Using A Bottle Brush And Sponge To Age and Faux Distress Furniture. Oh my gosh. This project was such fun and I made up the technique myself. The antique cedar chest was a mess. I think the “faux” antiquing process everyone tried in the 70’s looked good on the chest back in the 70’s. It looked pretty rough 40 years later. I was challenged to do a makeover that used unconventional tools or techniques. I grabbed a baby bottle brush and kitchen sponge and went to town. More details here…..Cedar Chest Makeover. 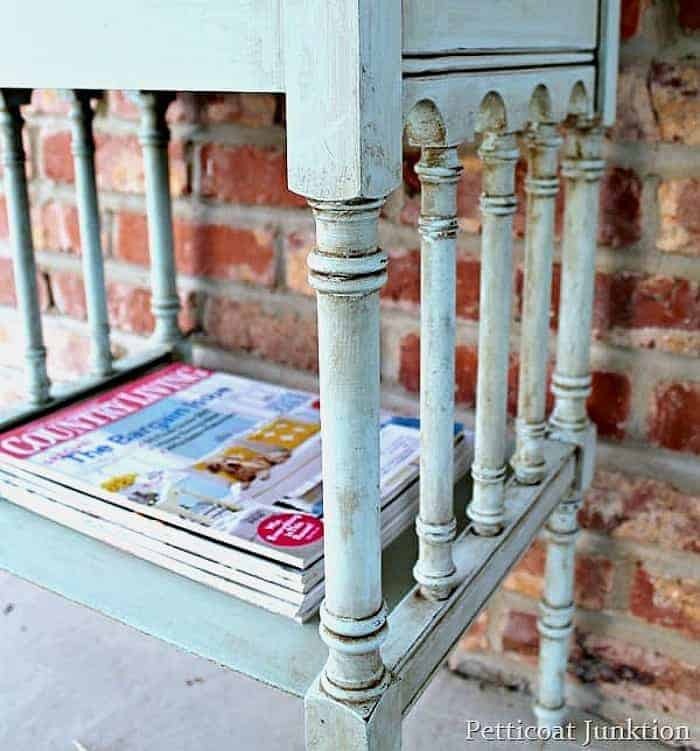 Milk Paint Tips And Tricks. Miss Mustard Seed’s Milk Paint is totally different from any other milk paint. There is a learning curve for sure. I learned something new with every milk paint project I worked on. I wrote a post with all my tips and suggestions on how best to use the paint and what kind of results you can expect when using the paint on different types of furniture finishes. The original stained finish on the furniture will determine how the paint adheres and/or chips. I hope these tutorials help you when you get ready to tackle a furniture project. If there is anything specific you would like help with or if you have any ideas for a furniture makeover for me to tackle, I’m all ears. I would love to hear your ideas. Maybe I’ll learn something new if you toss an idea at me. 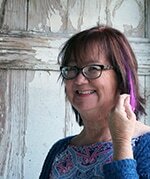 Favorite DIY paints, tools, and supplies on the Petticoat Junktion Amazon Page. Wow, Kathy! That is an awesome list. It’s great to have all that info in one post. I’m not sure where to start. What would you recommend as a starting project for someone–like me–who hasn’t done any significant furniture painting in years. And I mean YEARS! Like, in my thirties before my first child was born I painted second hand furniture for her nursery. I am now 74! So, I feel totally out of practice, but I’m eager to get going. I recently discovered you while researching chalk paints.I LOVE the style of your furniture and am diving in with both feet. A question for you: when you paint your furniture, is there any order in which you paint? Do you start at the top and work your way down; or do the tops/fronts last (or first)? 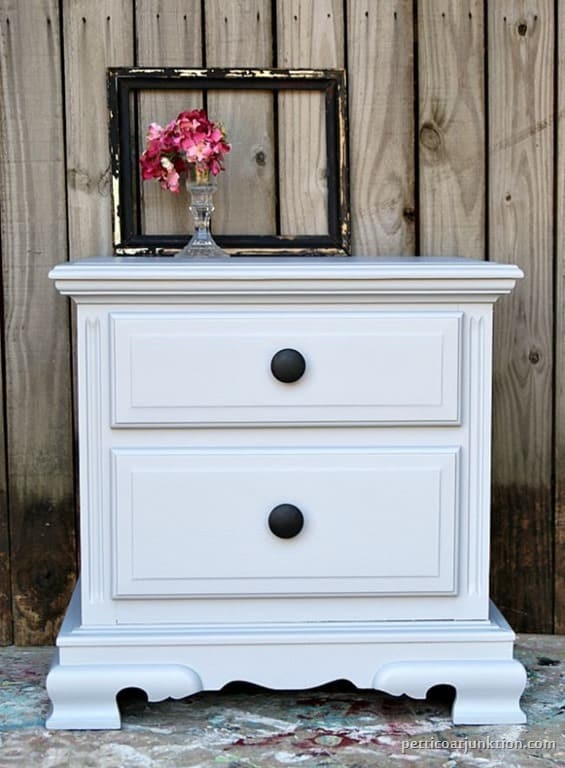 Your milk paint photos have me eager to try that now! Thanks for all your tutorials. Marcia, If it’s a chair or table I usually turn them upside down and start there, then turn them over and paint the top. If it’s a chest of drawers I’ll paint the sides, front, then the top. I always remove all hardware from the drawers and I usually paint the drawers last.